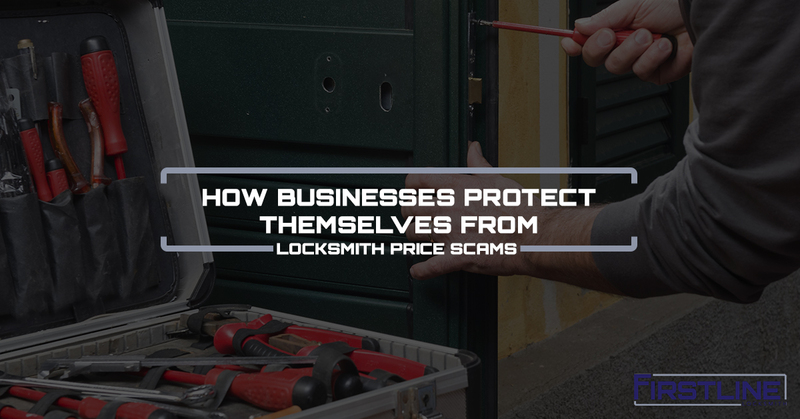 As a business in Paramus, New Jersey, you need to be on the lookout for locksmith price scams. If you’re not sure what to look for, Firstline Locksmith is going to share with you some tips. But before we dive into the article, want you to know that no commercial locksmith work should be done until you know the locksmith you’ve called is legitimate. Allowing work prior to doing your due diligence may cost you a ton of money. Always ask if the locksmith is licensed. Then, follow up with another question: is the individual who will be providing the service from your company licensed? In some cases, you’ll find that a locksmith company is licensed, but their subcontractors are not. This is a red flag to go and find another locksmith somewhere else. Make sure the commercial locksmith you decide to choose is insured. Similar to a contractor, you want to make sure the professional you’re working with actually knows what they’re doing. A license number allows you to report them for any negligence in their work. For most, a licensed locksmith is going to hold up their end of the deal and do great work. There are two categories of surety bonds when it comes to locksmiths: commercial and contract. The commercial bond allows locksmiths to work in specific industries, locations, or organizations like government, medical, or corporate. The contract bond simply guarantees the work of the locksmith at the highest level possible. You want to ask if the locksmith you’re about to work with is bonded, and then ask them which type of bond they have. For some, scamming businesses out of their money is the easiest way to do things. So they make the process of calling, quoting, servicing, and collecting a vague, abstract process. For example, a criminal may give you one price on the phone, show up and do the work, and then invoice you for something completely different. Now, it’s important to notice the difference between a legit commercial locksmith and one that’s running a scam. The legit locksmith will let you know when there are unknown price increases before they do the work so that you can make a decision before they move forward. A scammer will look for opportunities to charge you more, even if they don’t do any extra work without communicating to you that it will cost more. This simple price scam of quote, service, invoice is being done all over the United States, and it’s time you put the process on your radar. When you call into a commercial locksmith, they may be able to give you a rough estimate or quote over the phone. However, you want to make sure that the locksmith understands that the price may change once they actually see the services you need. The quote you got on the phone shouldn’t match what you actually owe. The difference is that you already know what the invoice is going to say before the locksmith hands it to you. Always get an invoice for the work completed, but you should be able to pay for the locksmith service without having to see an invoice because your locksmith communicated effectively and let you decide if you wanted the work completed. For a business that needs a commercial locksmith, nothing should be done by word of mouth. Get a contract, an estimate, and an invoice for every project you hire a locksmith for. It’s not enough to hope that the locksmith does their job properly. Most professional locksmiths will do a great job for you. However, that one who scams you is going to cost you a ton. As your commercial locksmith, Firstline Locksmith has been serving Paramus and all of New Jersey for years. Your business may need locksmith services, and we are the company to call. We’re licensed, insured, and bonded. Our reputation precedes us as one of the best commercial locksmiths in the area. Don’t hesitate and give us a call now to schedule your appointment.